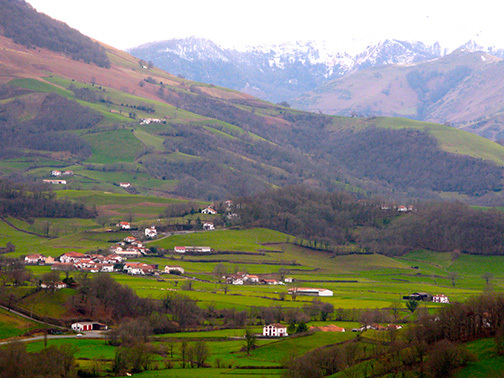 When most people think of Basque country, they usually think of Spain. 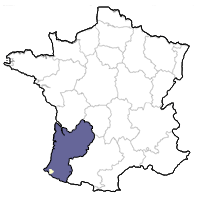 But 15% of the Pays Basque lies within the current French border, running from the coastal towns of Bayonne, St-Jean-de-Luz and Hendaye inland along the Pyrénées. This amazing part of France includes white sand beaches where international surfing competitions take place, as well as sparsely traveled, twisting mountain roads that offer wild, breathtaking views. 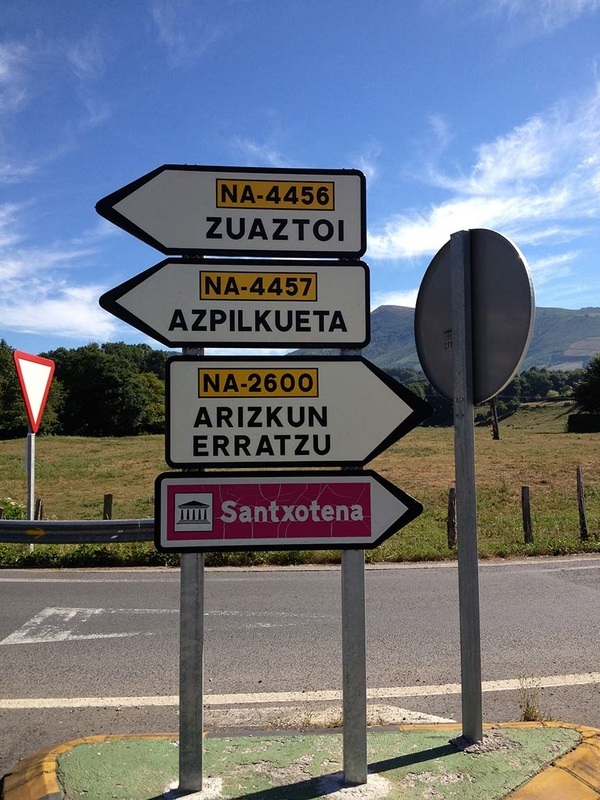 Once crossing the border into the Pays Basque, the road signs morph into both French and the unique Basque, one of the only surviving pre-Indo-European languages in Western Europe. The language’s origins are not conclusively known; the most accepted theory is that early forms of Basque developed prior to the arrival of Indo-European languages in the area, including the Romance languages that geographically surround the Basque-speaking region. 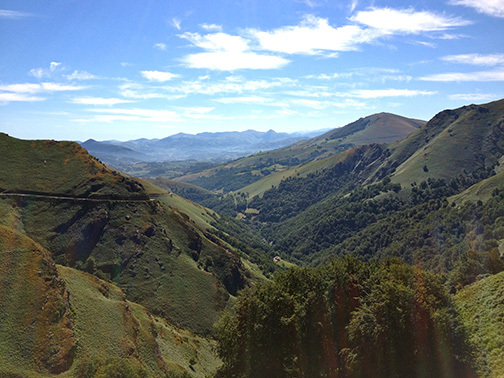 The French side of the Basque country has one wine appellation, Irouléguy, tucked within the valley that runs between St-Jean-Pied-de-Port and St-Étienne de Baïgorry, about 50 kilometers from the ocean. This area is famous for its dried Bayonne ham, brebis sheep’s milk cheese and piment d’espelette, a spicy powder made from ground small red peppers. In addition, this is the home of jai alai, and many small villages sport an outdoor fronton. Romans have made wine in this mountainous region since the 3rd century. Subsequent centuries saw the development of several monasteries in the region, which provided wine for pilgrims traveling along the Route de Saint Jacques that runs from central France and through Northern Spain to Santiago de Campostello. The region’s peak production came during the 17th century, when more than 500 hectares were covered with vines. Mining in the 18th and 19th centuries kept production and consumption levels high. Phylloxera wiped out many of the vineyards and a decline in industry gave little reason to replant the land. Raising sheep became the preferred livelihood for most farmers, yet many continued to grow grapes and make wine that was either sold in bulk or kept for consumption at home. A cooperative was set up in 1958, offering more modern production facilities and an outlet to market the region’s wines. But even the cooperative sold most of its wines in bulk to third-party négociants, who blended them with wines from other regions of France. Just about all the grapes grown were red and included the southwest stalwart Tannat along with Bordeaux varieties Cabernet Sauvignon and Cabernet Franc. In the 1980s, things began to change within the appellation. Etienne Brana, a wine producer, distiller and négociant in St-Jean-Pied-de-Port, began carving terraces into the side of a hillside that followed the curve of the terrain. By creating flat land between the rows, tractors were able to work between the vines, something that enabled producers to double and triple the amount of land they could farm. Before long, terraces began climbing up the sides of the verdant hills, and wine production in Irouléguy dramatically rose. Today about 70% of Irouléguy’s wine is grown on horizontal terraces, while 30% is grown on vines that follow the slopes of the hills. The terraces rise from 100-450 meters above sea level. They cover a number of soil types, all of which give a particular character to the wines. These include limestone, a sedentary rock with calcium and iron that brings roundness and elegance. Orphite, a second soil, is a volcanic rock containing iron oxide that was historically piled under railroad tracks. It brings structure and power to the wines and is found mostly in the southwestern part of the appellation. A third soil, gres rouge, is a metamorphic rock composed principally of quartz and mica, often used to construct door and window frames that adorn the region’s houses. Hard, acidic and red in color, grapes grown on this soil always have bright acidity. The Irouléguy vineyards cover 214 hectares (about the size of Volnay). Maximum yield is 55 hl/ha although, as vines are planted on hillsides with low density, yields per hectare tend to be much lower, normally in the 20-30 hl/ha range. Harvest is always by hand. Production in the region is about 6,400 hectoliters a year (800,000 bottles), of which nearly 90% is red or rosé. Irouléguy has a climate influenced by both the mountains and the Atlantic. Its hot and dry autumns marked by southern winds help prolong its growing season. The bulk of production in Irouléguy is red. Most producers have a number of parcels scattered around their villages and their blends often vary widely from year to year, depending on climatic conditions. 2013, for example, will have less Cabernet Franc because of rot at the beginning of the campaign. The stone in the soils gives the reds a mineral quality and delicacy unlike those found in either Béarn or Madiran. The Cabernet Franc influence also makes Irouléguy wines a bit lighter on their feet than their neighbors. That is not to say that Irouléguy is a light, fruity wine—it is still hearty, earthy and somewhat rustic. It simply has more red fruit than its Pyrénées brethren, and is a bit less mid-palate. Red Irouléguy wines normally display a deeply-colored robe that is opaque in its youth. Aromas and flavors typically include wild raspberry, black currant, iron, black cherry, licorice, blood and prune. The wines are medium to full-bodied, with acidity that helps lift the fruit and lighten its tannin. Because of its lighter tannins and bright acids, Irouléguy reds usually work well at the table and are light enough to possibly pour by the glass. They don’t necessitate the strongly flavored meats that Madiran shines with, and make good partners for pork roasts, lamb chops or squab. Rosé has also been popular for some time in the region, aided by the summer demand from la côte Basque. Deep in color, full-bodied and capable of aging, its closest equivalent in France would probably be Tavel—albeit with slightly lower alcohol. These rosés have some tannin to them and are polar opposites to pale, delicate rosés from Provence. Like the Basques themselves, these wines are bold and rugged, characteristics that match perfectly with grilled meats and charcuterie, in summer or in winter. A tendency over the past decade has been for vignerons to plant more white grapes, notably Petit Manseng and Petit Courbu. These are used for dry white wines that are sometimes aged in older oak barrels. These wines have good texture, with high-pitched floral notes solidified by apple aromas. The dry whites normally take a number of years in bottle to show their best, as they are relatively austere in their youth, and often display apple-malic notes. With two or three years of bottle age, the palate expands to display riper apple, orange and pineapple fruit with an iodine-like salinity. Like many Jurançon wines, Irouléguy whites often have a nose suggests they have some residual sugar, yet on the palate the acids kick in and bring mineral and salty qualities to the very dry finish.